Holy Land Hipster: Strawberries - Toot, Toot! Apparently, we are on the cusp of strawberry season here in Israel. I am so excited! 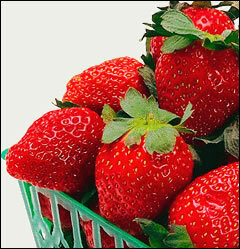 I love strawberries, I think they are my absolute favorite fruit! I managed to score a really small container of strawberries on Friday and I made Rob's famous fruit salad for breakfast this morning. I also went out and bought a tiny juicer, to use when I need to cook with lemon or lime juice. The fruit salad was yummy, I managed to pick a really sweet honeydue (ok, I'll admit it, until I opened it up this morning I thought it was a canteloupe), some good red grapes, the strawberries and a very ripe mango. I dressed it with some lime juice, honey and fresh mint and it was the perfect way to wake up this morning. And, with the sun streaming through my huge glass windows, it was heavenly. The weather in Israel today was amazing. No humidity, sun shining, warm in Tel Aviv and crisp in Jerusalem. Perfect! I went to Jerusalem this afternoon to try to do my homework and I failed, miserably. The assignment was to basically eavesdrop on someone's conversation and record it. Word for word. When we went to the Coffee Shop on Emek Refaim, we asked for a seat next to people speaking English. The waitress looked at me like I was absolutely off my rocker and sat us right next to three Israeli couples. Yup, the entire other side of the restaurant spoke English but we were surrounded by the natives. I didn't want to really seem weird and ask to move seats and so now, I have to find a cafe in Tel Aviv tomorrow and pray that there is one table of English speakers I can listen to for the assignment. I'm also in the hot seat on Tuesday and I'm already getting nervous. My second short story since arriving in Israel is on deck and a few classmates have already warned me to be prepared for the grilling. I can take it, especially if the comments are productive. If they aren't productive then I'll just shake 'em off. Tuesday I'm going back to Jerusalem, after class. We get out at 2:00 p.m. so I'm going to hop the bus with the Jerusalem crew from my program and make my way to the kotel. I haven't been there since my parents were in town and well, me and G-d need to have another heart to heart. I've been chatting with Him from Tel Aviv, but with this particular request I want to be in his House to make sure He can hear me. I've got important things on my mind. At some point this week, I need to make time to do another load of laundry. With the Opera on Wednesday night, I'm thinking Thursday is going to be my earliest opportunity to get my housekeeping done. I really miss not having a laundry room in my building! It was so easy at my UWS pad, I would run down in the morning with a load, and be back upstairs and at my desk working without worrying that some homeless person was rooting through my dryer to steal some clothing (I kid you not, that apparently happens here, which is why you have to watch your stuff like a hawk). Well, it's getting late and so I'm going to get ready for bed. Song of the day is Misty Mountain Hop by Led Zepplin. Not sure why, just in the mood for some Zep. Want to meet up after your chat with the L-rd?